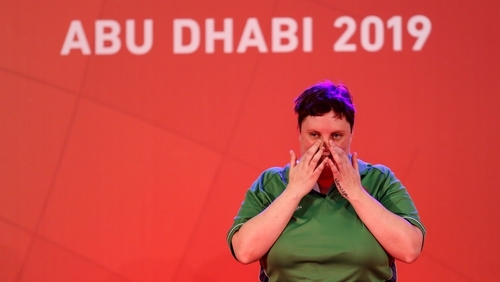 The head of delegation for Team Ireland at the Special Olympics Summer Games in Abu Dhabi has said she hopes people turn out at Dublin Airport tomorrow afternoon to welcome the team home. Team Ireland return to Dublin at around 2pm tomorrow laden down with a haul of 86 medals. Speaking on RTÉ's News at One, Emma McMenamin said the team "have had a fantastic games and are coming home with a quite a significant medal and ribbon haul". Ms McMenamin said there have been a number of standout performances, including by the ladies basketball team, the Bocce team and by Co Donegal gymnast Patrick Quinlivan. However, she said the beauty of the Special Olympics programme is the opportunities it provides athletes. "Yes we are a sports organisation and we provide the competitive opportunity for our athletes, but there is a holistic approach and it is a huge experience for them in terms of independence, finding their own feet and finding who they are. "We've about eight athletes who, until they got on the plane on 7 March had never been on a plane, had never left Ireland, had never been away from their families - that is a huge learning curve for them and to do it while representing their country, I think they've shown great strength." Ms McMenamin said the families of athletes would be in the arrivals lounge of Dublin Airport tomorrow for "an informal reception", and she encouraged members of the public to turn out and show their support.